The Formidable Forms plugin can be integrated with the WP Affiliate Platform plugin to capture leads when an affiliate referred visitor submits the form. You place a form created by Formidable Forms on your landing page. The visitor decides to fill in the form on your landing page. After the Formidable Form is submitted, the affiliate plugin detects that this user was sent by an affiliate. The affiliate plugin captures this lead in the lead capture table (the site admin can later check all the leads). 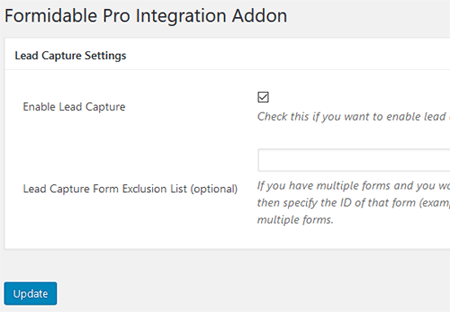 Step 1) Download and install the Formidable Forms integration addon. Step 2) Go to the settings menu of this addon by clicking on the Formidable Forms link from the Affiliate plugin’s admin dashboard menu. Step 3) Enable the lead capture option and save the settings. You can also specify some form IDs to exclude them from the lead capture pool (this step is optional). Now, when your visitors (referred by an affiliate) submit a form, the lead will be captured in the WP Affiliate plugin. You can view all the captured leads by going to the Mange Leads menu of the plugin’s admin dashboard.